I’ve had an unexpected development with my extreme enthusiasm for tough strength training- I keep sitting out my Wednesday morning runs. I’ve woken up each Wednesday to find that a pretty key area of my body is sore. Last week, it was my quads from the stationary lunges and an intense spin class the following day. This week, I have a sore hip flexor, I think from squats because this happened the last time I integrated squats into my routine. That time, I didn’t pull back on my schedule though and tried to blow through it. It wasn’t disastrous, but I think it remained sore longer than if I had just let it rest. So for the last two weeks, I’ve skipped my runs on Wednesday. 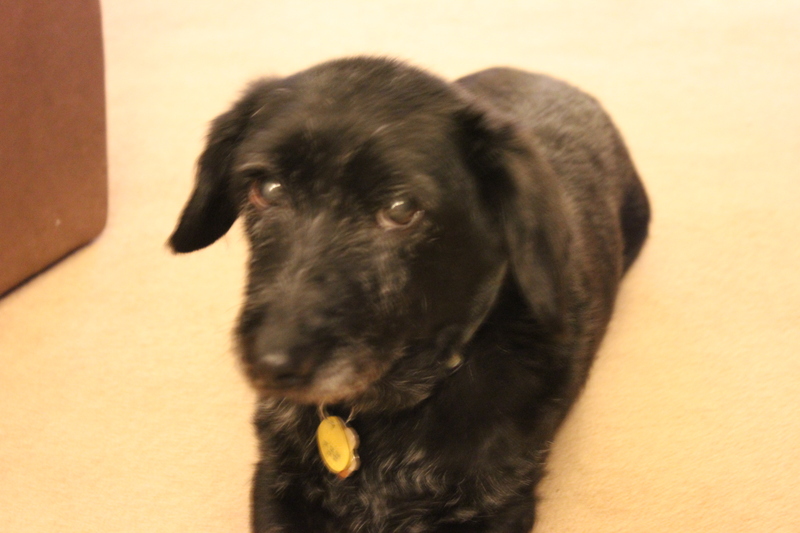 In fact, I’ve ended up taking an out-right rest day, save for possibly a dog walk. In the past, I haven’t liked taking a rest day smack in the middle of the week, when I need the energy surge that my morning exercise provides the most. And while I was training for my half, I would totally feel guilty if this happened- as if that one run would make or break my training (I knew it wouldn’t, I was just in that mindset). I was initially annoyed both Wednesdays, but I’m realizing how much I actually appreciate it. For one thing, the sore areas certainly benefited- they were generally gone or minimized by Thursday so I could dive back into the swing of things without prolonging the discomfort. More importantly, I’m really enjoying running again, both mentally and physically. Granted, I haven’t been logging tons of mileage- my planned four miler this morning would have been the longest in a while, but I cut it to 2.5 miles after being up much of the night with a sick pup. A shortened run is worth it to take care of this little man. But the quality of my runs are greatly improved. For about a month before my half marathon and the couple of runs immediately following it, I just was not on my game. Luckily the race itself was a great run, but for all others I was constantly having some sort of leg ailment, mostly in my glutes, and I was just feeling tired and not thrilled to be on the road. Ever since I’ve returned from vacation and started returning to my familiar morning paths, I’ve noticed a vast improvement. My legs were a tad sore initially from using those muscles again, but they quickly fell back into habit. I haven’t experienced the tightness and soreness, or the accompanying lethargy. Each run just feels good. Even this morning, I felt a little sleep deprived and knew I was going almost embarrassingly slow as a result. But my body felt good- so I felt good, and just went with it. It’s good to be back in that place. Sure, I think part of it is that the sun is now up around 6 a.m. and my runs are primarily sunlit- always a helpful motivator. But I really think my improved running experience stems more from allowing my muscles rest when needed, coupled with working them in other ways through spinning, strengthening and yoga. Yes, I want to add on more mileage. But without a major race on the horizon until September at the earliest, I’m going to do it oh-so-slowly in an attempt to maintain the running quality of my excursions now. I may want to improve my pace, but at this point I’m actually really content with where I am if it means that I continue to use the big grin emoticon on Daily Mile the vast majority of time. I want most of my runs to feel this happy! Right now, quality is far more important to me than any other running indicator. And if more rest and lower mileage are the means of achieving that, then I’ll take it. Posted in All Posts and tagged half marathon, Long run, recovery day, Running. Bookmark the permalink. Since returning from my Grand Tour of the Southwest 2012, I have been slowly but surely getting back into my routine. I was really eager to do so. Before I left, I was about two weeks post my first half marathon– although it feels forever ago now- and honestly wasn’t in a great fitness place. I just didn’t have that super strong desire or motivation. I don’t think it was necessarily not having a race to train for anymore, although I’m sure that was part of it. I think I was just in a mini-funk, along with having lots of other activities occupying my time. My trip really reinvigorated my fitness motivation. Being out in nature can do that to a girl. I loved the endorphin rush I got from finishing a strenuous hike- ones that a couple of years ago would have been really difficult. I just felt so inspired to start training for a race again, to build on my strength training foundation, to expand my yoga horizons, and to try new activities. So as I refocus on my fitness goals and routine, I have a new mantra: Push myself. That was partly why I was in such a funk. My strength training was beyond stale, and I was using my hectic work schedule as a reason not to do it, or to only do quick easy exercises to fit it in. My runs just weren’t meshing. My sleep schedule was a bit off, so I was skipping yoga. The only thing I still got a kick out of was spinning. A class that is always different and uber challenging, each time. I needed to push myself. So after easing back into my routine last week, I’ve really upped the ante this week, especially in the strength training department. My arms and quads appear to be the beneficiaries- so much so that I was too sore to run this morning and I opted to take a rest day to let my muscles breathe. But it also feels so good to feel sore again. It’s good to push myself! I’ll go into depth about what I’ve been doing and my plan of attack (for now) on this front tomorrow. My one disappointment is that I have only run twice since getting back. A combination of freakish weather, several late nights and this week muscle soreness has prevented me from tackling the roads as much as I hope to. Tomorrow it’s supposed to pour again so I may still have to wait until Friday. But I do have some ideas in mind for this as well- which may include a Ragnar relay that a co-worker just spoke to me about literally a half hour ago!- and really hope to re-engage my running these next few days. I feel focused, motivated, and ready to push myself beyond my comfort zone! I’m so glad to be back! Posted in All Posts and tagged half marathon, Ragnar Relay, Rock 'n' Roll USA, Running, strength training, Training, Yoga. Bookmark the permalink. My husband and I talked a little about how I’m a very goal oriented person after the half marathon this weekend. I’ve always believed that it is important to have some sort of goal to be working towards, to provide a sense of purpose. This has usually been a professional focus- what job did I want to strive for, what aspects of my job did I want to improve on, what degree do I need to have certain options open to me, how will I pass the bar exam the first time. So the half marathon was a different type of aspiration for me, but it helped fill a void that law school left- a GOOD void, mind you. Training helped provide some sort of structure and I liked knowing that there was a tangible accomplishment in my near future, something I can look back on with pride. Which begs the question- now that the race is over, what next? I’ve read that it is very common for runners after completing a race that they have trained a long time for to have a sense of loss and to feel adrift now that the goal is just gone. I don’t feel that extreme- I’m not restless at the thought of not having to plan my weekend around a long training run. Maybe if I didn’t have my spring break to look forward to I’d be feeling more anxiety. Instead, I feel like I need to evaluate my fitness levels at this point, think about where I can improve, and set some mini-goals from there. I don’t necessarily need a race to drive my fitness, because I just like how exercise feels. And in fact, there were some aspects about training that I didn’t like. Primarily I didn’t like that my other fitness priorities, mainly strength training, became casualties- as work has picked up, I have to choose between workouts, and the running would have to win if I wanted to be ready. So my first priority for now is to refocus on my upper body and core strengthening. My planks have become few and far between, and after hitting 70 push-ups in one session, I’ve slacked in that area as well. A strong upper body is important for running to avoid fatigue. On a shallower level, it makes me look and feel better about myself. My sleeveless dresses look better, and my tops are flatter across my middle. And I like that. More importantly, I have found myself feeling a little tired in the arms and core in other activities like yoga and spinning, which I don’t like. So it’s time to make these exercises central to my rotation once again. Additionally, I’d like to mix things up and challenge myself in these areas. First I’m just going to work to get my basic foundation back, but after that I need to try new things. I’m thinking a bunch of stuff- maybe trying one of the spinning-strength combo classes, a yoga vinyasa that I have yet to attempt, and simply incorporating new basic exercises with kettleballs (bells? Probably should figure that out!) and advanced plank poses. Anything to set the bar higher and make me feel a little sore in these areas again is very appealing to me at the moment. Running-wise- well, I may not feel like I NEED a race to keep me motivated, but that doesn’t mean I don’t already have my eye on a few new ones! 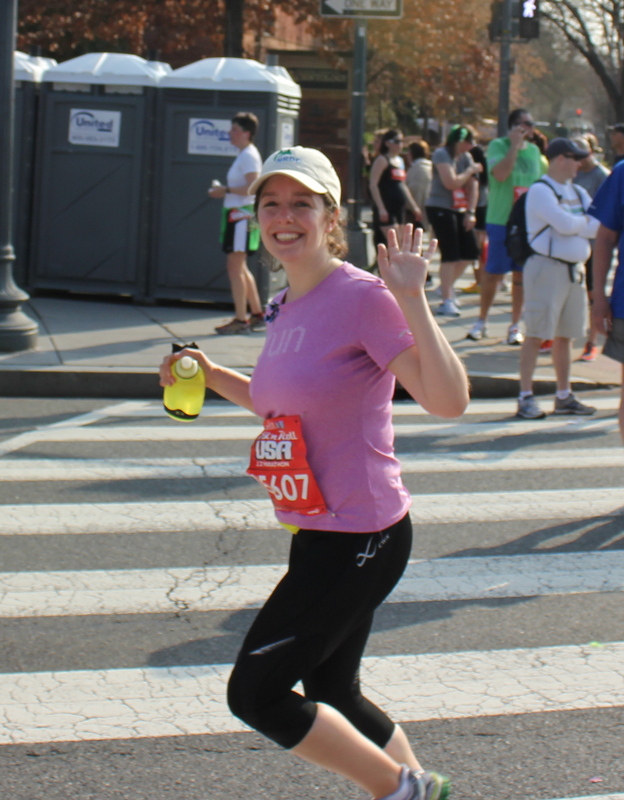 In particular, I’ve pretty much made up my mind to do the Woodrow Wilson Bridge Half Marathon. This is for several reasons (I’m a lawyer by training, so I always have several reasons to back up my logic). Like many of my race choices, it’s very close to my apartment. In fact, the pick up area to Mount Vernon is walking distance. Works for me. It’s in October. I had been thinking about the Chicago Half in September, but after this weekend realized I have no desire to have the height of my training in the heat of August. October seems like a safer bet. It sounds like a really great race, down the Mount Vernon Trail that I frequent so much for my long runs and across the bridge. Well, I am a goal oriented person. In the meantime, I really want to work on improving my running foundation. I’m pleased with my half PR, but one way I can get better is simply by running more than I have been. Most of my weekday runs were in the 3-4 mile range. This was mostly due to my knee being cranky with all the new mileage. Since I don’t have to dramatically build my mileage in the near term, I’d like to work my way to running my week day runs solidly in the 4-5 mile range comfortably. I’m planning on keeping up with long runs most weekends in the 6-9 mile range so that the long runs aren’t a complete shock to my system again. I just like long runs in this mile range, it’s a nice way to spend the weekend. I also plan to slowly start upping my speed on my runs by incorporating a tempo or fartlek. Obviously this is meant to set a new half PR, but also because I think I need to start challenging my daily running just for the sake of keeping it fresh, without a singular race driving me. That’s what I’ve been ruminating on the last few days since my half. I’m in rest mode now- well, I don’t know if yesterday’s spin class counts, but my legs are feeling good so I figured why not? But otherwise I’m definitely dialing back the running, and probably won’t really start focusing on my running goals until after my spring break in mid-April. I’m planning on doing some 5K’s and 10K’s afterward to keep me on track and help me measure my progress. I’m really looking forward to this next phase- it’s now about improving my running performance, not just doing the activity. It’s a nice place to be. Posted in All Posts and tagged core, half marathon, new PR, push-ups, strength training, tempo run, Woodrow Wilson Bridge Half Marathon. Bookmark the permalink. 1) Try eating a banana roughly 30 minutes before start. I’m someone who needs to eat- I just don’t operate without food. I ate a good breakfast before RnR, but three hours had passed by the time I made it to the start line and I was feeling hungry, which stuck with me until Mile 4 when I allowed myself my first Gu. I don’t think this impeded my performance at all, but it’s worth experimenting with. 2) High five everyone who offers it, especially the little kids. It just feels wrong blowing by them. 3)Don’t run a warm weather half. Saturday was probably my limit temperature wise. The last stretch was really warm, and strong sun is kinda distracting. Since it is March, it would normally be a good bet to run this time of year but this year is just weird. Another downside to global warming. 4) Nothing tastes better than chocolate milk after a long run. Thank goodness it’s the new ‘it’ drink. I pounded my little carton, it just hit the spot in ways water couldn’t. 5) I don’t really have an appetite once I’m done running. The milk tasted like heaven, and I ate a banana right after that, but despite being hungry at the start of the race, that dissipated by the end. When my husband asked what I wanted for lunch, nothing appealed to me. I had to force myself to eat a bowl of Cinnamon Toast Crunch when we got home. I do think the heat had something to do with it, in my previous long runs I would be starving within 30 minutes of finishing. But racing also adds another dimension, I’m sure. 6) My bra strap is a useful place to stick ear buds under. I had tucked my buds under and over my shirt, but they kept either falling back down or tumbling over my top, which was annoying. It dawned on me halfway through to tuck them under one of my straps, and voila, they were still and not a distraction. 7) I’m glad I don’t rely on music. Trust me, there are days when I need music to run, and I brought my iPod as a crutch in case I needed a push (hence the ear buds above). But I definitely enjoy racing without it. You can take in the race so much better. Plus, the few times I have raced with the music, I didn’t really listen anyway. And while I think it’s totally valid to use it if you need it, I have to admit it was really annoying to have to avoid runners who drifted my way or who made it difficult to pass them because they had headphones and weren’t paying attention to their surroundings. 8) Spectators make a huge difference. Both loved ones and the many anonymous ones. It really helps you keep moving and inspires you. But there really is something to having a loved one there, or multiple ones. My husband hasn’t gone to my other races to date mostly because I would tell him not to- usually it was too cold for him to stand around. There’s just something so…I don’t even know the words, but my spirits really soared when I saw my husband and my friend Amy. It made my race. I need to be better about recruiting more friendly faces, I’d really love to have my parents watching sometime. 9) I would be exhausted the next day. I expected that I would pass out at 9:30 Saturday night, which I did. What I didn’t anticipate was how exhausted I would still feel on Sunday. We woke around 7 am, had a yummy pancake breakfast, and went to the grocery store. At this point I was starting to feel really fatigued. Around 1 pm, I laid down on the couch and just crashed for a good hour and then some. 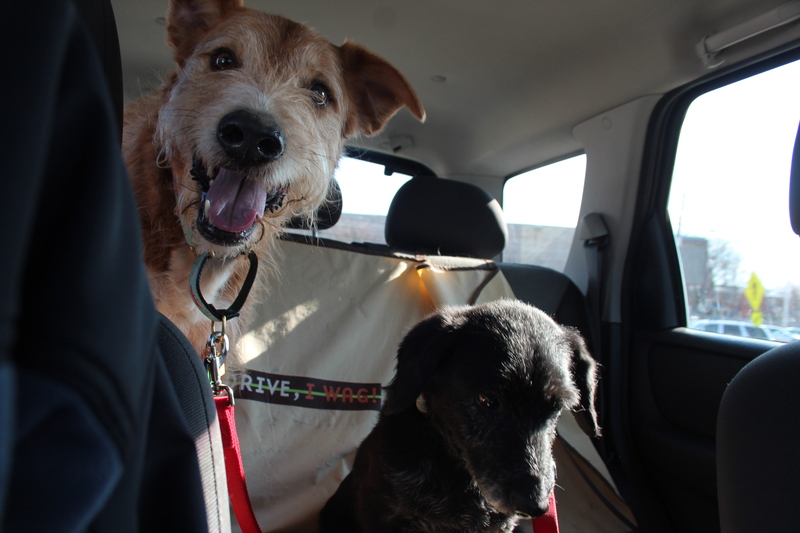 It took me a long time to rally and take the dogs for a walk afterwards. No one told me about that feeling post-race! 10) Keep walking/moving. I already knew this from my long runs, but it’s better to walk around a lot afterwards. When I’m a bum and lay around, it takes longer for my legs to recover in the days afterwards. My legs are still a little sore today, but definitely mobile. I think it’s because I took the dogs on a walk and did a lot of cooking- basically, aside from my super nap, I was up and about. I’m feeling really good today. 10) If possible, a good night sleep the night before is key. Sometimes nerves will get the best of you, and adrenaline should be sufficient to pull you through. That’s what happened for me at the Hot Chocolate race. But I felt the difference this time- I felt energized but calm, and just raring to go because I slept soundly the night before. 12) Red Rocks in Old Town is the best for pre-race pizza meal. I thought pizza would be a good pre-race meal for me, and I was right. My husband and I met our friends for dinner there, and I devoured almost an entire arugula and cherry tomato pizza on my own, with just a little help from my friend Christine. I don’t usually do that, but I was actually pretty hungry and figured the extra fuel would help, as long as I didn’t get uncomfortably full, which I didn’t. I think I’ve found a pre-race routine. 13) Steak frites, a side salad and red wine is the PERFECT post- race dinner. When debating dinner options, I thought I was leaning towards Ray’s Hellburger, but then remembered Rays to the Third, steak frites outpost of the Ray’s the Steaks mini-chain. We decided to try it, and like all the Ray’s, it was outstanding. As I mentioned, I hadn’t been hungry and really didn’t eat that much all day, but that dinner really hit the spot perfectly. My husband said this can be a new tradition for my long distance races- although he added he may also have to start racing if he was going to insist on eating like he ran a full marathon. In addition to his hanger steak, cream spinach, side salad and beer, he managed to do serious damage to a large coconut milkshake from Ray’s Hellburger. That’s my man. Posted in All Posts and tagged first half marathon, half marathon, post race, Rock 'n' Roll USA. Bookmark the permalink. Once again, another unpredictable week. And once again, challenges for my fitness regime. Strength training is the victim this week. I’ve brought my gym bag with me every day this week, fully intending to get some training in at lunch. And yet… it hasn’t happened. Monday it was because I was feeling totally drained. My knee had been a little agitated after my run on Sunday, so I took Tylenol PM Sunday night. The good news is that the pain has vanished. The bad news is that the medicine didn’t sit well with me, so I felt really out of it all day. And hungry! That happens to me sometimes when medicine is messing with my system. So anyway, I just couldn’t summon the will or discipline. Tuesday, the weather got the better of me. I love the summer temperatures without the oppressive humidity. Well, yesterday was a touch humid, but still superior to July or August around these parts. So I traded in gym time for a nice lunch time walk. That may have ended in an unplanned visit to Anne Taylor Loft. I’m pleased to report that my wallet was not damaged in any way…yet…but there are items still calling my name…. At any rate, I don’t feel too bad about that missed session. I think I can justify it. Today, I was incredibly busy, for both work and personal reasons. My husband and I realized that our Spring Break is only a few weeks away and we still don’t have all our lodging. We were horrified to discover that, contrary to our (ok, my) preconceived notions, there are actually a lot of people who DO want to camp at Zion, Arches and Canyonlands National Parks the first two weeks in April and probably booked long before we did. Huh. More surprising- I was able to get a site at the Grand Canyon, which I thought would be the more difficult since it is generally more popular. Never fear, we worked it out, but it still took a large chunk of the day, in addition to all the mini fires that kept popping up for clients. My work load has definitely picked up this year, which is great, but makes it harder to sneak away in the middle of the day. Thank goodness I’m a morning exerciser! I had a tough but fabulous spinning class yesterday that really got my heart rate going. Seriously, eight one minute interval sprints with only 15 second recoveries, followed by several steep hills- at 6 am! This morning I had the best run I’ve had in a while- my legs were tired from spin still, but otherwise felt really good. A nice easy three, nothing that will wear me out for Saturday, of course. I’m already signed up for Power Hour Yoga tomorrow morning. Plus, we’ve been taking family walks in the evenings, since it’s so nice out- a pleasant 1.5 mile jaunt around the Masonic Temple is perfect post-dinner activity. I also did some foam rolling on Monday and tonight. So it’s not as if I haven’t gotten any exercise- in fact I’m doing quite well. Strength training is really important, however, so I need to start thinking of ways to make sure I fit it in. I won’t sweat it too much this week, though. I figure that the extra rest will do my body good for my half. Tomorrow, I hope to write about my visit to the Rock ‘n’ Roll Expo to pick up my registration package, as well as some of the things I’m planning to bring with me to the race. Work is looking pretty busy again though and my sister-in-law will be in town for a visit, so it might be tough but I’ll definitely try. I’d really love some input into what I should be prepping to have with me for the big day! Posted in All Posts and tagged early morning exercise, half marathon, Rock 'n' Roll USA, Running, spinnin, strength training, Yoga. Bookmark the permalink. Yesterday was my last long run in the lead up to my first half marathon. It was also the longest I have ever run. And boy, did it feel that way! I was a little apprehensive heading into yesterday’s run. Mainly I was nervous about experiencing troubled tummy again after I did last week. I have a pretty resilient stomach, not prone to upset. So when I did have some issues for a few hours following last week’s 11 miler, I was concerned. 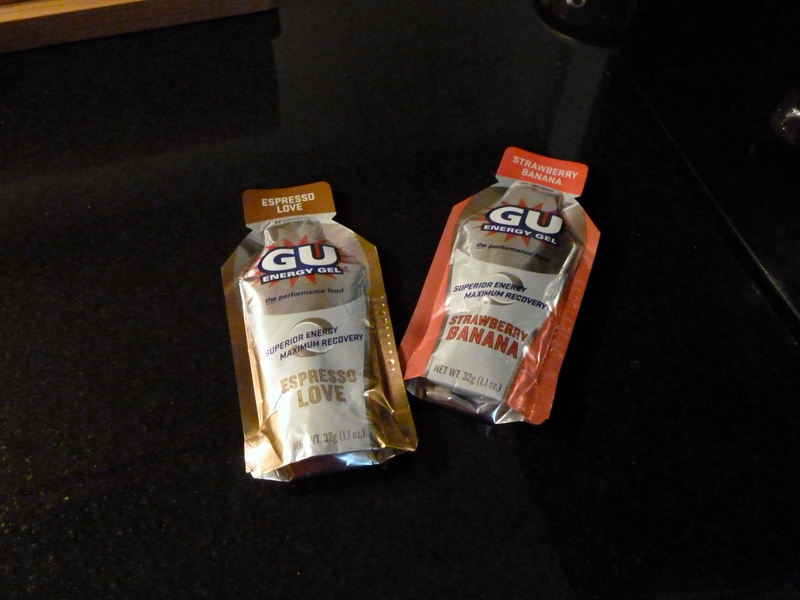 It was the first time I had taken two Gu’s on a run, which previously I had no issue with. I was debating if I should try something else, but if I had been fine on previous runs with just the one, what was the likelihood that I was suddenly irritated by it? With just one more chance to really try this out before my race, I did research a bit and found some information pertaining to taking Advil before a run that can cause issues with running gels, which is what I had done. So I decided to just try the two again and not take Advil. I also decided to try taking it later in the run. And I’m pleased to report I was fine. I should be good to go for the Rock ‘n’ Roll. The two finalists...with Espresso coming out on top! I must say, I’ve been surprised by how much I don’t mind the Gu’s, and even like them in some cases. Normally this is the kind of thing I don’t like- artificially flavored stuff like fruit candies make me gag more often than not. The Gu’s have been a pleasant surprise. Much superior to the pretzels and Gatorade combo I’d been trying out before. I think I’m going to go with two Espresso for the race. The run itself was a tough one- my toughest to date. I think it would have gone a little easier had I not slacked off since a DISASTROUS run Thursday morning that really got to me. Plus, I was a single parent from last Wednesday until yesterday afternoon, and had some after-work commitments for a few days that just made for a more hectic schedule. Had I been better about yoga and my regular routine, I think the physical aspects would have been better. Just me and these two troublemakers for five days! Basically, my hamstrings and glutes were pretty tight the entire run, and were particularly bad somewhere in the middle. I had to stop and stretch a few times. This I definitely mark up to not enough yoga. I also hit a bit of a mental wall a couple of times, feeling like I wanted to walk pretty badly because the run wasn’t flowing as nicely as I’d like. The last push up the hill that runs through Old Town to my apartment was not great- I usually pick up the pace and finish on a high, but just didn’t have it in me this time. To sum up, this run tested my limits. That is not to say, however, that this was a bad run. Not all tough runs are bad runs. Running is often about challenging your stamina and physical abilities, and while it may be a struggle, overcoming that challenge is often the reward. And that’s how I felt about this run. I may not have run as fast as I would have liked- about an 11:15 minute pace- and I may not have experienced the total euphoria I usually feel with most of my long runs. But it was the longest I had ever run, and 12 miles is far! Most people in my life, including my soccer-superstar and fitness fanatic Dad, can’t fathom running that far. So it should be challenging, but I did it. It has given me the confidence that if the Rock ‘n’ Roll is more of a slog than a free-flowing run, I have the mental toughness to keep going. So, while not the best, I still chalk this up to a good run. The weather was beautiful- I’ve sure chosen the right ‘winter’ to train for my first half- and the new parts of the Mount Vernon Trail that I explored were spectacular. That’s a good run in my book. Now I begin winding down. I was in a bit of a fitness funk last week due to the jumbled schedule and some sleep issues. I’m determined to get back on my game this week . So aside from today, which will be a total rest day to give the muscles some relief- the hammies and glutes are still sore despite stretching and foam rolling yesterday and this morning, although much better than before either session- I’m going to really work on cross training, strength training, yoga and some easy, hopefully pleasant runs to get me in the right mindset for two weeks from now. Posted in All Posts and tagged half marathon, Long run and short run, Mount Vernon Trail, Rock 'n' Roll USA, strength training, Yoga. Bookmark the permalink. Someone left a comment on my racing page that I need to sign up for more races this year, seeing as though I don’t have anything listed after my half marathon debut (19 days! Look out racing world….). I couldn’t agree more, and in fact, I already have a few in mind. The issue? Money. My husband and I have our spring break trip coming up. Yes, in a month from now I’ll have achieved two goals- the half marathon and FINALLY making it to my Southwestern National Parks! But between hotels, camp sites, flights, rental cars, food and other fun excursions on the trip, I’m a little tapped out. And man, races are expensive. But, I’m not completely deterred. I’ve got the bug. What can I say? I love having a goal. So here’s what I’ve been looking at. First, there’s the George Washington Parkway Classic. I really want to do this 10 miler because it’s my usual long run route, without the traffic. The Parkway is beautiful, and I’d love the opportunity to run it without speeding cars and all that. I’ve pretty much decided to do it- I was apprehensive earlier because I haven’t raced all that much, and wasn’t sure it would be a good idea so soon after my first half. Plus, I’ll be OUT WEST for two of the three weeks prior and I won’t be fitting in any training. But I’ve been overcome with a ‘seize the moment’ mentality of late and figure why put off for next year what I can do now. Still…the fee is a little much at the moment. So in a few weeks, when the next paycheck comes round, if the race isn’t full yet, I’ll do it. If it’s fully subscribed, well I’ll just take it as a sign as something to look forward to next year. Now, for my next half! I know, I know, I probably should wait to actually run one to decide whether or not I want to do it again. But I have a feeling I’ll want to. I’ve enjoyed the training, especially the long runs. So why wouldn’t I enjoy the race as well? My thinking? A Chicago race. I’ve only been once, when I was 12. And more importantly, my youngest sister moved there almost two years ago to get her PhD in school psychology- yeah, she’s pretty smart. I promised her I would go visit, but last year wasn’t an option since it was my last year of law school and the bar exam. I also said I wouldn’t go in the winter. I already have to experience Cleveland winters occasionally as my husband’s roots are there. One Great Lakes tundra is enough, thank you. Pros: Get to visit my sister sooner, have a great spring race to look forward to, allows me to avoid the potential misery of training during the DC summers. Cons: Trying to come up with the racing fee and paying for a flight in the next couple weeks. Also, if I do that flight now, I’ll probably have to forgo going to my parents’ over Memorial Day, a bit of a tradition for me. Pros: more time to train, something to look forward to in the fall, and more time to budget appropriately. Cons: Timing! First, I’m not hot on the idea of training in the summer here, as mentioned above. I mean, last summer it was often +80 degrees at 5:30 am when I would go for my run. Also, its only a few days after the political nominating conventions- my husband will be covering both and hence will be gone for two weeks at least prior. Not sure that I want to extend our time apart. Some things to think about. I’d also love suggestions for races to do- any must-do ones? I’m not interested in marathons, but anything below that distance is a possibility. Also, given that my husband will be traveling covering the campaigns a bit, traveling isn’t as much of an option this year but I’d still like to know about them. And I definitely want to know about great local races, in particular in rural Virginia- I love it out there! Posted in All Posts and tagged Chicago, George Washington Memorial Parkway, half marathon, Mount Vernon Trail, Racing. Bookmark the permalink.